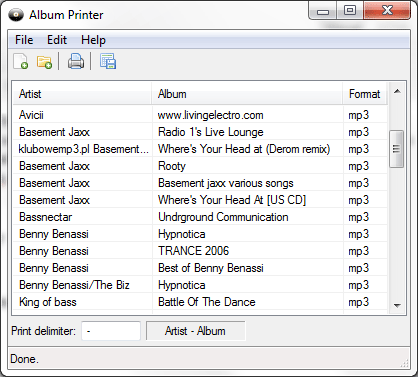 Album Printer is a Freeware Portable tool created by Skwire. It can be used to create a list of all of the songs listed in a music directory, and or from individual songs that are dragged and dropped into the interface. It uses the artist and album audio file tags for each song. Additional features include; Export to CSV file, customizable artist and album delimiter, supports reading tags from mp3, ogg, flac, wv, mpc, ape, wma, mp4, and m4a audio formats.